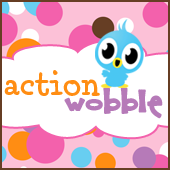 Action Wobbles: Action Wobble: Brrrr!!!! It's Gloria from Girlia's Cards. Thanks for joining us here at on the action wobble blog. It is a little late for this card simply because spring has sprung! At least I can see the ground now. It is hard to believe that just a week or so the ground was covered with snow and it was cold. Can you imagine penguins shivering? Well that is exactly what these guys are doing on action wobbles.